Warm summer nights call out for a get-together and there’s nothing quite like getting all the family together with the smell of your favorite BBQ lingering nearby. Here, at Grills Forever, we want to be the ones that help you to find the best pellet smokers in 2019 that will really make your summer. That’s not all! With some pellet smokers, you can even cook your food right into the long winter months if they come with the turbo-heating technology! Wood pellet smokers are increasingly popular these days. With that comes the inevitable market influx of products. So, how do you know which ones are the best? We, at Grills Forever, have seared, smoked and grilled on grill after grill for the sole purpose of providing our readers with the most authentic review of the best pellet smoker grills on the market today. What to Consider When Buying a Pellet Smoker? Who are The Pellet Smokers For? First, we are unbiased: We are not affiliated with any certain brand of grills or smokers, nor we are getting any money from them. This means that our reviews are accurate, the best, and geared towards you: we’re only here to help you decide on what to buy. Second, we’re the experts: We know what we’re talking about. Grills Forever is run by hardened grilling top enthusiasts and hobbyists. This means that we’re experts in this field and know what to look for and how to conduct a proper research. Fourth, we’ve been around for some time now: We’ve been around and we’re here to stay. Our review website has been around for over 6 years now, still going strong. For 6 years, we have been loved and able to serve our readers diligently and we have no intention of stopping now. Here, at Grills Forever, we independently promote only the best smokers out there so you, as a buyer, can make the perfect buying decision. If you’re looking for an objective and accurate top pellet smoker review out there, you’re at the right place. What Is a Pellet Smoker and How Does it Work? Pellet smokers are a combination of a grilling machine that you can use as a gas grill, a charcoal grill, a slow-cooking smoker as well as a kitchen oven. It’s essentially a wood-fired grill. They come equipped with a pellet hopper that feeds wood pellets into the fire steadily, ensuring that a constant stream of wood smoke is infused in the food. 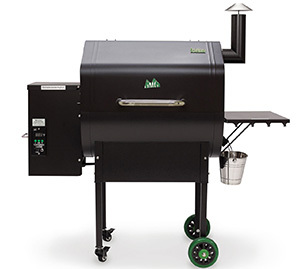 Simply put, a pellet smoker is an all-in-one solution for the hardened grill masters. When looking to buy a pellet smoker you’ll no doubt hear all sorts of specifics. Let’s break it down a little. Pellet Feeder: Pellet hoppers have a small opening at the bottom that holds a large pellet auger. These augers are responsible for delivering pellets from the hopper to the firebox at a steady pace. Fire Box: The firebox is a rectangular structure with small holes in the bottom and a fan underneath. It comes with an igniting rod that ignites the wood pellets coming in from the auger. Pellets are delivered from the auger steadily, usually by a rotation system, to ensure that the heat and smoke are maintained as you desire. Price is always an important factor. We all want affordable products, but buying a low-quality, cheap smoker could mean you have to spend more money in the future. A good-quality grill at a convenient price will be durable and be used more because you will be satisfied with your purchase. Who can benefit from pellet smokers? They are for anyone who loves the taste of BBQ. Honestly, these smokers add a whole new milestone in the world of smoker grill. It represents an easy user and environmentally friendly method as well. You experience all of these benefits by using a pellet smoker. One thing you must keep in mind: Do not forget to get a smoker with an electric start and auto auger control. These functions will make your experience better and your life easier. Environment-conscious people: By the way, do you really care for the environment? If you do, then you should start burning pellets now. Have a look at the chart to see some amazing information! 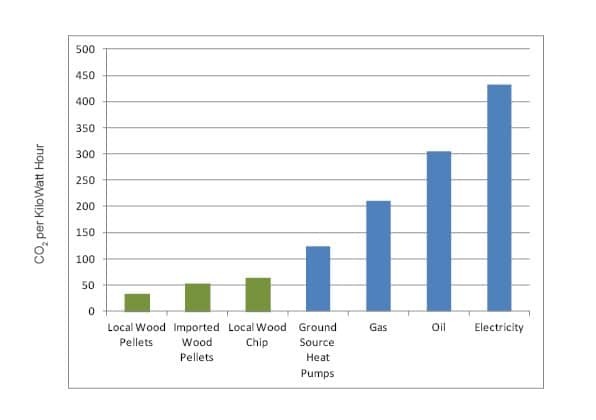 Figure Adapted from “The Carbon Balance of Woodfuel,” Northern Woodheat, 2010. Burning wood pellets produces up to 90% less Carbon Dioxide than traditional fossil fuels such as gas or oil. Burning just one ton of wood pellets can replace approximately 400 liters of oil – saving up to 1,070kg of Carbon Dioxide from entering the atmosphere. In other words, any smart person will choose the top pellet smoker out there for many reasons. You will get best smoked trout or pork prepared by yourself with only one-third of the effort compared to other smoker grills. I am decently smart and I love pellet smoker because it works wonders. Should You Upgrade or Change Your Current Smoker Grill? Will upgrading solve my problem? Do I know how to perform this upgrade? Like I said before, sometimes you will find it difficult to perform the upgrade yourself. Replacing the digital control system seems much more difficult than I thought when I did it. Your smoker manual will certainly help you in this regard. You should seek help from YouTube as you can see what exactly to do. When is it the right time to change it completely and look for a better one? Honestly, it solely depends on what type of upgrade you need. If you do not get the desired amount of smoke, you need then check your induction fan. Maybe it does not function properly and changing one will cost you around $30 – $40, problem solved. That’s right! Every time we have a BBQ party, we are reviewing something. But it’s not all fun and games all the time. The process gets expensive pretty soon and these are the sacrifices we make to bring you the best value. Since we are barbecuing experts, our top pick will definitely be a pellet smoker that is appropriate for almost everyone looking for a pellet grill. Camp Chef SmokePro DLX Pellet Grill is built to help the outdoor cooking buffs take their backyard cooking venture to a whole new level. With the Patented Drop down cleaning system & digital advanced temperature chip, Smoking was never so easy. All time favorite. Why Is It Our Top Pick? You must have thoughts in your mind centered around the thousands of pellet smokers and why SmokePro DLX Pellet Grill by Camp Chef is our no 1 choice. We will list the detailed features, pros and cons of this smoker. First, let me tell you why this smoker grabbed the top spot on our pellet smoker review. For you to understand we made point by point notes detailing why we like it so much. This grill has full automation from start to clean the ash off. If you want that type of automatic smoker, you need to increase your budget over 900$ – 1000$. PG24 by Camp Chef is special because of its comparatively low cost. The auto pellet feed is great. Though you can see this feature represents 80% of the present-day smokers, we relied on the fame of camp chef. Three years have passed with no jamming at all. We also loved this smoker because it has an auto shut down feature. That means you can even go to the office and enjoy delicious smoked ribs by dinner time. Only 30% – 35% of the existing smokers have got this feature. Many other features, like its automatic control and built-in meat probe have made us select this smoker as the top one in our pellet smoker review. And the most amazing fact is the price. In the price range, we never thought that we could get all these features and benefits. We took all the top smokers into considerations like the Rec Tec smokers, but this SmokePro DLX Pellet Grill by Camp Chef can beat all through its performance and affordability. 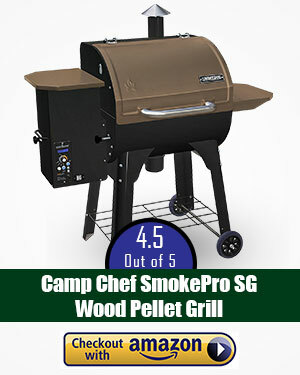 SmokePro DLX Pellet Grill by Camp Chef features tons of built-in features, designed to facilitate the cooking process. It is a smoker for cooks who are serious about getting the real taste of barbecues from their smoker grills. It’s worth your money believe me. Let’s look at its top features. 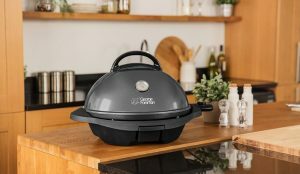 It also features an dual electric ignition switch plus LED dual temperature displaying the cooking temperature which is one of the top things that a user should look for. 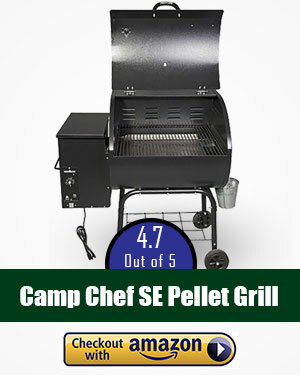 This Pellet Grill by Camp Chef Pellet Grill also brings along a digital controller which you could use to set your desired temperature and at one point the heat in the chamber will be automatically adjusted. It allows meat to be smoked for hours at a temperature of 150 degrees F. You could increase temperature to 500 degrees F for searing and grilling. With convection, the cold and hot areas of the grill can be replaced with even heat. This smoker has a weight of 124 lb with a pellet hopper that has 20-pound capacity. That’s so large, you won’t need to worry of getting more before your meal is done. This approach allows you to have the ultimate cooking experience. When the temperature drops, one wood pellet is released. This convenience can’t be found in other grill types, like gas or charcoal. Now we come to the part no one likes and that’s cleaning. This smoker won’t clean itself but it does make the process a lot easier. Camp Chef SmokePro DLX Pellet Grill is created in a way that gives you easier access to the fire pot making cleaning out the ash effortless. It also has trap door that allows you to clean the unit without scouring through grease and ash. Anyone who has ever had to clean a smoker grill knows how time-consuming and enormous the task can be. This trap door is only present in expensive units, but you’ll be glad you paid a little more when cleaning becomes effortless. You could also buy the other version that could come with cover (which is $50 more expensive) to make sure the smoker is in the best condition at all times. This allows bypassing the relight feature in case of a power outage in your home. Power outages may not happen often but when it does, this feature can save the hot rod from any wear and tear. It proves that the manufacturers actually did a lot of homework when designing this unit. This wood pellet smoker is the best choice for any expert smoker. Its reasonable price and amazing features make it a good prolonged investment. It comes with lots of nifty features that facilitate, smoking, grilling and searing in your backyard. 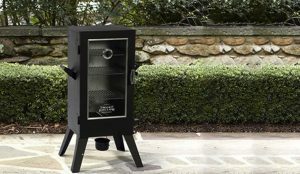 For all these reasons, in our pellet smoker review, we consider this smoker as the top choice for the serious BBQ buffs. Why is this our Runner Up Pick?? Camp Chef Woodwind offers a state of the art pellet grill with digital temperature controls, a patented ash cleanout, and perfected sear box offering up to 900 degrees F! The stainless steel grill is visually pleasing and guaranteed to bring flavor to your food. This pellet grill is guaranteed to take your cooking game to a whole new level. The versatile grill offers endless options for grilling, smoking, baking, roasting, braising, and barbequing anything your heart desires. The pellet grill can reach temperatures anywhere from 160 F to 500 F! Talk about a whole lot of grill power. We gave it the 2nd spot on our list doesn’t mean it has less number of features than PG24 (INFACT IT HAS MORE). 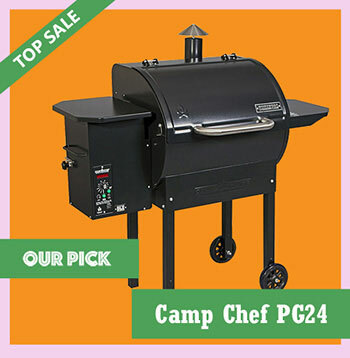 The main reason we chose this grill as our second pick to the Camp Chef PG24 is its price which is on the higher side. 1. The Woodwind grill contains “Smart Smoke” technology that guarantees the most accurate temperatures. This digital gauge will ensure you maintain constant heat at temperatures you want. No more burning food and awkward barbeques! 2. Cleaning up is a huge part of the grilling experience that no one likes to think about. Take comfort in knowing this grill has a simple and easy clean out process. The grill contains a patented clean out container that simply requires you to twist and dump. No need to take apart the grill here! 3. The grill offers one of the best sear boxes on the market. It can reach up to 900 degrees F giving your food a crisp and perfect sear. The 16,000 BTU stainless steel burner also contains a built-in ignition. The sear box offers grill masters another state of the art tool in their arsenal. While the sear box is an awesome feature, it bumps up the price compared to the PG24. 4. The versatility of the grill allows you to prepare all of your favorite dishes to your specifications. The hardwood pellets bring out natural and juicy flavors of your food. Additionally, the grill uses convection heating that circulates the burning pellets throughout the grill. The combination of these techniques draws out the best flavors and gives your meat the perfect cook. 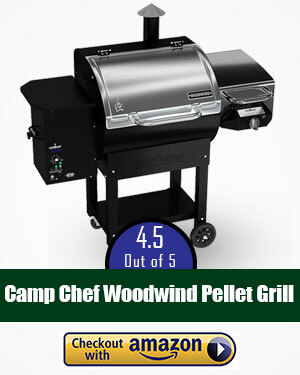 Our 2nd Pick: Camp Chef Woodwind Pellet GrillThe Woodwind Pellet Grill offers an all-encompassing and powerful grill for a reasonable price. Its digital temperature control, large cooking area, ash cleanout system, and elite sear box give the grill an edge over the competition. The ease of use and diverse features allows the most novice cooks to use the grill. In addition, experienced grill masters can admire the beautiful aesthetic and dynamic features of the grill. With a temperature range of 160 degrees F to 500 degrees F, you can cook however you want. Braise, grill, roast, bake, smoke or barbecue your foods — that’s entirely up to you. This smoker is powerful enough to cook even the most demanding dishes. 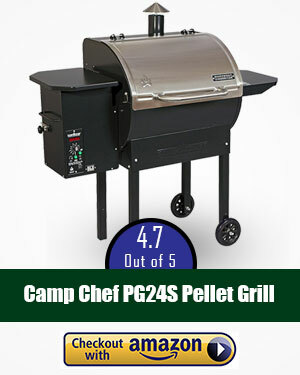 The Camp Chef Woodwind Pellet Grill was chosen as our second choice because it lacks some capabilities of the PG24. The grill is rather heavy, at an overall weight of 146lbs. The contrasts with the PG24 which is 124lbs. The PG24 also contains a shutdown feature that gives the user more flexibility. This allows the grill to do more of the cooking for you. Lastly, the Woodwind pellet grill is more expensive than the PG24. The PG24 is overall a better bang for your buck. At an affordable price, you already get all of the features you would need for a wonderful time outdoors. Its WiFi compatibility takes convenience to a whole new level. Control your cooking through your phone! It’s the lowest priced smoker in our list. Lots of excellent features that you would expect on a much-higher priced item. In fact, it satisfied most of the features we looked for when reviewing pellet smokers. Wi-Fi compatibility – control it through your phone! Sense-Mate feature which monitors the grill temperature. In addition, the Davy Crockett Pellet Grill comes with multiple accessories. These include a meat probe, peaked lid (which is useful for large fowls and stand-up chickens), rib racks, a convenience tray as well as utensil hooks. This takes away the trouble of having to order additional parts for modification. This grill’s Smart-Smoke Technology brings the luxury of convenience to your succulent, smokey BBQ with the press of a single button! The price is worth the amazing experience! A truly great smoker! This unit costs almost half of what most high-end smokers cost, but it offers equal (or even better!) features. This 8-in-1 smoker and grill lets you enjoy the fun of grilling, smoking, baking, roasting, searing, braising, barbecuing and char-grilling! 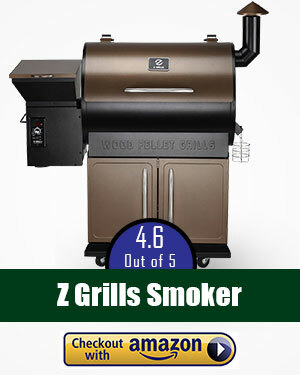 With just one push of the button, this Z Grills Wood Pellet Grill and Smoker uses its electric auto-ignition system to fire up your grill using authentic wood pellets. You got that right, it doesn’t use gas, propane or charcoal! Most traditional grills and smokers would have you struggling to reach the desired temperature, but with this unit, that problem is long gone. All you have to do is set your temperature using its digital controls, and press a button to get it heated up. The Z Grills Wood Pellet Grill and Smoker comes with a primary cooking surface of 513 square inches, plus a second cooking rack with 187 square inches. Its large cooking space makes it ideal for large events, letting you grill, smoke, bake, roast, sear, braise, barbecue and char-grill all sorts of food at once. Why is this our Portable Pick? Easy to fold legs and versatile cooking options make this grill an ideal decision for any outdoor activity. It even has digital temperature controls! 6-in-1 features: grill, smoke, roast, bake, braise and BBQ! 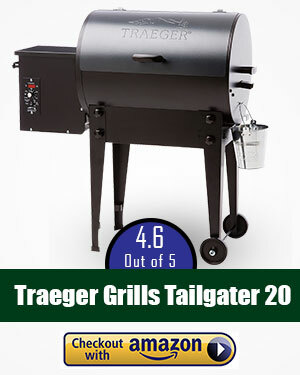 The Traeger grill and smoker is extremely easy to transport. It comes with EZ-fold legs which allow you to easily pack it up and throw it in your car trunk, ready to go. With a height of 38 inches, width of 35 inches, and weight of 76 pounds, this can quickly be transported to even the most rugged terrain. Being portable doesn’t mean it has to be extra small. This smoker boasts an accommodating 300 square inches of grilling space. This is enough to cook around twelve burgers or three racks of ribs. Perfect for families going on camping! With its Integrated Digital Elite Controller, temperature is kept constant within + / – 20 degrees Fahrenheit. It also allows for low/slow and hot/fast smoking for up to 450 degrees. Checking up on your food’s temperature is also made easy with the LED display, which clearly shows the temperature even under bright daylight. Using 100% hardwood pellets, this smoker gives you authentic, smoky flavored foods whatever you do with it, whether it’s smoking, grilling, baking, roasting, braising, or BBQing. You get the wood-fired taste all of your guests are looking forward to each time. 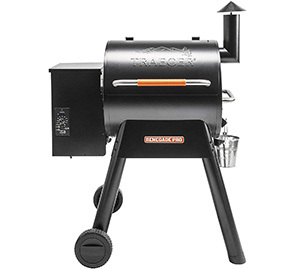 Overall, the Traeger Grills Tailgater is a top choice for outdoor trips with small families or groups. While it doesn’t deliver the most convenient and advanced cooking as compared to the other picks in this pellet smoker review, it does have the right degree of portability and functionality needed in any outdoor adventure. Whether it’s smoking, grilling, searing, roasting, braising, char-grilling, baking, searing or barbecuing, you can do all of that with just one product. Pit Boss takes pride in their top-of-the-line cooking process. 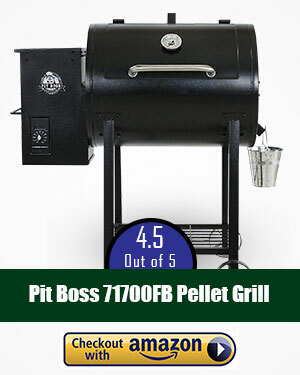 The Pit Boss 71700FB uses a fan-forced air accelerate to maintain the flame, achieving that flavorful smoky taste. Its flame broiler also has two cooking settings, direct and indirect, that elevate the food’s flavor while keeping excess grease away. No gas, propane or charcoal used here. This smoker uses 100% natural cooking-grade wood pellets. You won’t have to worry — the wood pellets don’t contain any fillers, adders, scents or adhesives. This delivers that authentic smoky flavor without risking your health. With a 6-in-1 feature, this smoker and grill lets you cook whatever your heart desires. Get ready for some pro-level cooking. Aside from coming with porcelain-coated grills that are non-stick in quality, the product comes with an ash cleanout system which makes it easy for you to simply dump the ash and get started on your next cooking. This smoker offers a variety of useful functions that will allow you to smoke, grill, bake, braise, roast and BBQ anything and everything. It’s definitely worth your money because if you take care of it properly, it’s going to last you a long time. Camp Chef made this smoker with a built-in temperature gauge and a great grease management system. These features make the process of grilling fun and the cleanup afterward easy, all for a fair price! Although this would not work as a portable grill, it does come with built-in wheels for convenience. 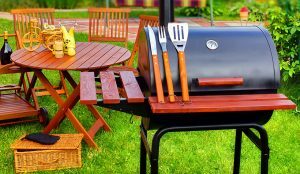 You can easily transfer your grill to any part of your backyard and it will stay secured in place (as long as it’s on an even surface, of course). This grill offers the patented ash can and hopper clean-out system that makes cleanup easy. I love this smoker because, with the press of a button, you can check the internal temperature of your meat! 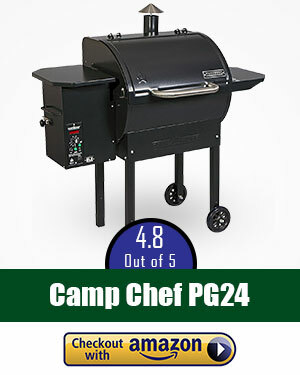 The Camp Chef PG24S is one of the most high-capacity, heavy-duty smokers we’ve ever used. For its size, it’s fairly easy to operate and won’t require you much maintenance. Although it’s quite heavy, it definitely cooks large amounts of food for big groups. Overall, a great investment that will last you a long time. Everyone who eats BBQ knows that authentic smoky flavor is the best kind. With real hardwood pellets, this smoker easily creates professional-level flavors. The Camp Chef SmokePro utilizes its famous Smart Smoke Technology in using wood pellets efficiently. This makes sure that your foods are smoked to top quality. Because of this, you can “set it and forget it” so that you can sit back and relax. Available in 24-inch and 36-inch units, the Camp Chef SmokePro is packed with great features for their size. It features a massive 811 square inch rack surface area, perfect for grilling multiple foods at once. Using an auto-dispensing pellet hopper that can hold 22 lbs of pellets, grilling is made convenient and efficient. This smoker uses dual meat probes to determine the temperature, and then displays the internal temperature through a convenient dual-LED temperature readout display. You don’t have to risk losing heat just to check on your food’s temperature every once in a while, making sure that you get tender and juicy food all the time. Just like most Camp Chef products, this pellet grill smoker uses a patented ash cleanup system that takes away the trouble of vacuuming. Ash is immediately stored in an ash clean-out cup that’s easy to dump. Cooking area of 800 sq. in. Great heating technology with auto-ignition and set-and-forget controls. Temperature range of 180-500°F with auto-shutdown safety if it reaches 650°F. Good build quality – made from robust stainless steel and high-temperature powder coating. 1100 sq. in. cooking area including removable grid. Built from 14-gauge heavy-duty steel. 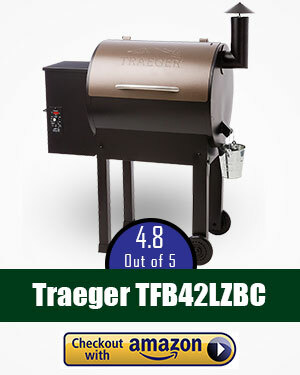 Quality build – the third Traeger Grill to make it in our reviews. Their motto is “think everything” – so you can cook pretty much anything on it! During our research, we left no stone unturned. We have gone through all the available brands out there and considered their best products before shortlisting the ones for more detailed research. Since we have gone through the trouble of researching them, we figured we’d share the names of the best products anyway. Among the Cookshack products, the Fast Eddy’s PG 500 and PG 1000 stand out. But if we are to choose the best from these two, we’d rather suggest you go for PG500 since that will be the best product from Cookshack. Priced around the $530 range, this product can go head to head with its already impressive counterpart – our advanced pick, Z Grills 7-in-1 wood pellet grill. However, with that product having even better features than this one for a relatively lower price, it failed to land a spot anywhere in our review. This is an expensive product compared to the ones in our review. However, its build quality and features are simply the best among the $800 price range it comes in. But when we looked at the users’ preferences, this product found a pretty low rating. If most of the users aren’t willing to buy it, we wouldn’t want to suggest it for you either. Without a doubt, this is a grill suited for the grill master. But due to its $5000 price tag, we cannot, in good conscience, suggest it for home and personal use. Hence, this product came to this section instead of our top 10 list. Outdoor Gourmet is one of the more obscure names in the grill industry. However, it does have a considerable fan base, leading us to investigate this product as well. During our research, this is a product we found worth mentioning in this article. FireCraft, after retailing many different brands of grills, chose to get into this game and released their own line of products. Among them, we believe that among their products, the Q450 stands out. Lighting Mechanism: The lighting mechanism, as has already been mentioned, is responsible for firing up wood pellets. Although its individual parts cannot be found for all brands of pellet smokers, the whole mechanisms can be found bundled for all of them. They usually include a lighting rod with wires, a connection pin and thermocouples. Wheels: These are not only replaceable, but are also affordable, available and necessary. More often than not, you’d find that the wheels are wearing off if the smoker sees heavy movement. We’d suggest you not to trail your smoker around with your car (unless it’s a trailer rig) if you don’t want to replace these very frequently. Door Thermometers: Not all pellet grills come with a door thermometer, but for the ones that do, don’t see any problems with this device very often. On the off chance that your one gets broken by that stray throw by your kid, you should be able to get a replacement for it online. Auger Motors: These are the single most important things for a pellet smoker to function properly (apart from the Lighting Mechanism). If you find yourself in a situation where you need them to be replaced, you’d be able to get one for $30-$50 at a local home depot, hardware store or online. Fan Motors: The best fans and fan motors come pre-bundled for use if you find your grill not working properly. Replacing these parts are simple and with the internet in the tips of your fingers, you won’t be hard-pressed to find a video tutorial for it after you buy one. PID Controllers: Digital controllers for these smokers are replaceable, but they need to be purchased separately for different brands of pellet smokers. Unfortunately, there is no “One-Model-Fits-All” controller out there. Chimney, Hinge, and Body Parts: Loose body parts like screws, hinges, and chimneys for your pellet smoker can be widely found at a hardware store or online. May it be the casters for the wheels or a broken axle, you wouldn’t have much trouble finding a replacement for it. Grill Covers: They protect the grill from dust, water and the weather in general. Direct Grill Grates: These allow you to add some more cooking space for cooking and a different grill marks pattern for your meat. Meat Probes: You’d want to know what temperature your meat is at when being cooked. For grills that come without meat probes, or if your existing ones are broken, you can get these accessories to help you out. Cooking Utensils: Grill tongs, grill cleaners, scrapers, spatula…. Whatever you need for cooking, are usually sold (and sometimes bundled with your product) by your smoker manufacturer. Flat-Top: A flat top griddle can be placed over the grills to get a different cooking experience and increase the range of items you can cook. Pellet Hopper Extender: Some models of smokers allow you to attach a hopper extender, allowing it to hold a larger amount of wood pellets to be cooked with. It is extremely useful for increasing your slow cooking times without the need for supervision. Burners represent an important component of your smoker grill and you need to inspect them often. Make sure there are no blockages or corrosion. Cleaning your burn pot with the proper methods will provide great benefits. Certain parts of your smoker grill will wear out faster than others if you use your smoker a lot. So, you may need to replace them every few years or so to have the best experience. The gasket represents the place where the dome meets the base. This makes for an easy fix and you can purchase a kit and have it repaired in no time. If you are concerned about the shine on its exterior, always use dish soap, warm water, and a scrubbing sponge to clean it. Also, avoid metal brushes or steel wool. Remove stubborn stains by scrubbing using diluted ammonia or vinegar. And you can remove the water spots using unsweetened club soda. Lubricate your motor and fans for optimal use. This will help your smoker work better and last longer. Note that you should not store your grill for long idle time periods. Doing so can cause the structure to warp and mold to form under the grill cover, which of course can render the entire grill unusable or inefficient. Keep visiting this page because we will always be the first ones to bring you the newest and the best news about the innovations in grills and smokers as well as updating you on the best pellet smokers out there on the market today. We hope that we have answered all of your questions with our top ten pellet smoker reviews. If you’re still asking, “should I buy a pellet smoker?” then the answer is undoubtedly “yes!”. 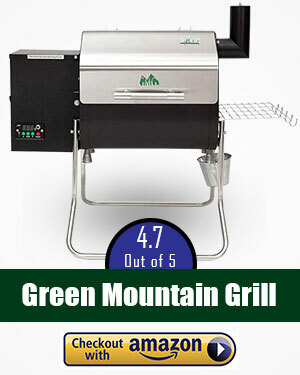 And you certainly won’t go wrong with our Top Pick, the Camp Chef SmokePro DLX Pellet Grill.